Joe Feddersen is a multimedia artist whose work explores the modern, urban landscape of power lines and flat screens by referencing and reimagining traditional, Indigenous designs and patterns. Feddersen writes that his work “merges basic elements of basket designs from my ancestral home— Okanogan and Lakes people of the upper Plateau region of the Columbia Basin—with urban imagery to speak to perceptions of land, positioning traditional icons with those of urban sources.” For Feddersen, the land is the constant. It is the marks made on the land that change, as people build new structures and introduce new technologies. Whether making prints, baskets, or glass works, he participates in an artistic practice—passed down for generations—of reading the landscape, extrapolating its abstract designs and patterns, and creating art that expresses a profound sense of place. Feddersen was born in 1953 in Omak, Washington, a town bordering the Confederated Tribes of the Colville Reservation, where he is an enrolled member. His father was the son of German immigrants. His mother was Okanagan and Arrow Lakes (Sinixt), two of the 12 bands included in the Colville Confederated Tribes. Colville ancestral lands span approximately 39 million acres in Central Washington and Southern British Columbia. The U.S. government established the reservation in 1872, severely reducing the tribal lands, which are now 1.5 million acres. The reservation’s topography has changed drastically over the past century as a result of dams the U.S. government built in the 1940s, which altered the course of the Columbia River, forced thousands of people to relocate, and decimated the salmon population. Feddersen grew up on and around the reservation, camping, hunting, and fishing with his family, and visiting relatives on both sides of the U.S.–Canada border. Feddersen recalls that, when he was growing up, everyone in his family made things with their hands. He began taking art classes in high school and went on to study fine art at the University of Washington. His mentors included the printmaker Glen Alps, who encouraged him to find his own path as an artist, and Vi Hilbert, an Upper Skagit tribal elder who played a major role in the revitalization of the language and culture of the First Peoples of the Pacific Northwest. Feddersen went on to earn a Master of Fine Arts at the University of Wisconsin, then returned to Washington to teach art at The Evergreen State College from 1989 to 2009. Feddersen studied basketry in the 1990s with his friend, the artist and poet Elizabeth Woody, who taught him traditional Plateau practices. In 2003, he began working in glass, in part, so he could produce works on a larger scale. 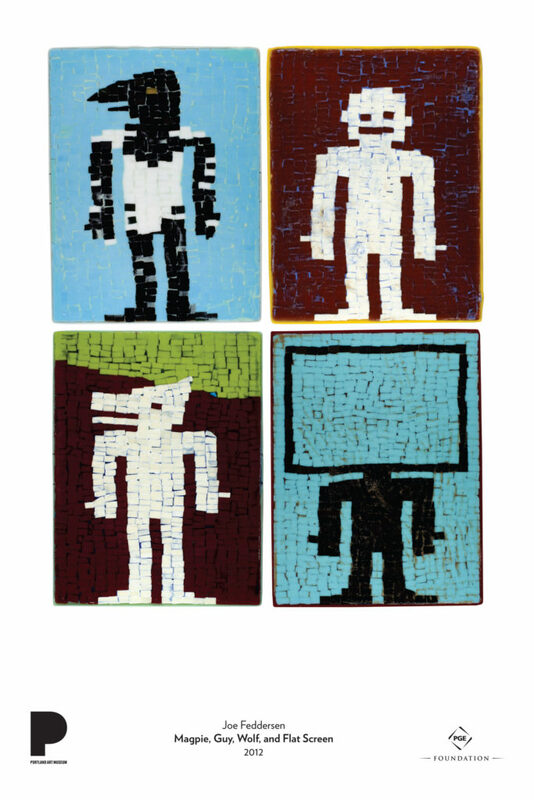 The series of works reproduced here—Flat Screen, Wolf, Guy, and Magpie— positions traditional icons (wolf, magpie) alongside urban markers (flat screen, guy). Feddersen presents these individual figures against bright, abstract fields of color. His use of small, square and rectangular pieces of glass evokes the grid-like pattern and geometric shapes of traditional Plateau baskets. At the same time, the small glass pieces suggest pixelated, digital images on a display screen. These works communicate the playfulness and sense of humor that runs throughout Feddersen’s artwork. Why do you think Joe Feddersen chose to include this collection of figures—Flat Screen, Wolf, Guy, and Magpie—in this artwork? What does each figure suggest to you? How do they relate to each other? Compare this series to Feddersen’s Red Roll Call (2010) basket, also at the Portland Art Museum. What similarities and differences do you notice between the two pieces? How does each medium allow Feddersen to express his ideas? Compare these works to Northwest Indigenous basketry by other artists. As you look at the landscape that surrounds you—inside or outside your home or school—which shapes stand out to you? What patterns do you notice? Create a drawing of your environment that features only a few geometric shapes and patterns. Identify a design or figure that you associate with your family and cultural traditions. It could appear on a dish, utensil, clothing, or picture. Write a short paragraph about what the design or figure means to you. How does it remain meaningful in your life today?